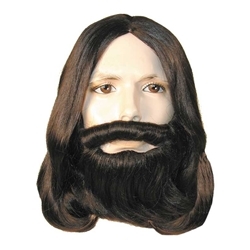 This version of our Biblical wig and beard set comes with a fairly long wig with a matching beard and moustache on a strap. This is an excellent set for Jesus, the Apostles and other Biblical characters. It is also suited for many theatrical characters and periods.